Independent authors are learning the powers of e-books and how to publish on Amazon with the help of Digital Marketing Labs. According to a recent article from the Digital Marketing Labs, Amazon has by far become one of the biggest Internet destinations, and people looking to connect themselves with the e-commerce king have learned to publish on Amazon Kindle and make their content available to the hordes of paying customers. For the most comprehensive information on the process of publishing on Amazon using its Kindle Direct Publishing program, Digital Marketing Labs has released the Special Report “Partnering with Amazon: How to Give Amazon Permission to Sell Your Products to their Over 275 Million Registered Buyers.” In it, authors and entrepreneurs can find out how to create, format, submit, and categorize their writing to maximize Amazon’s potential. The millions of credit card-wielding customers who look for topics they are interested in suddenly become an audience for anything Kindle Direct Publishing can produce. Kindle Direct Publish is the fast, free, and easy way to self-publish, said the article. That means Amazon is in the creator’s corner when they publish on Amazon Kindle. It’s in their best interest that the e-books succeed. Amazon wants content to be available, so they make room for it and make it easy to go from manuscript to finished product. Even better, claimed the article, is the fact that the creator makes the price determination. The process of getting published in the traditional print industry has stiff competition in e-books, said the article, as digital readers cut down on production costs, inventory investment, and the risks involved in low demand. The step-by-step procedures, complete with screen captures and supplementary optimization suggestions, will help any entrepreneur’s voice be heard. The flexibility and control Amazon offers puts more power into the hands of the individual and not the corporation, said the article. 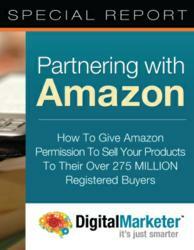 “Partnering with Amazon” has everything one needs to be set up self-publishing e-books on Amazon. Expert experience and analysis went into the report, and it’s an example of Digital Marketing Labs’ ability to look towards innovative and modern techniques for marketing, driving sales, and increasing recognition for any individual or business.